Minonk Woman Among Delegates to Promote Pork in Washington, D.C.
SPRINGFIELD, ILL. - Pam Janssen of Minonk was one of ten representatives from the Illinois Pork Producers Association (IPPA) who traveled to Washington, D.C. for two days as part of the National Pork Producers Council (NPPC) Legislative Action Conference. Mrs. Janssen is president of the IPPA. This two-day event allows pork producers from Illinois the chance to join fellow producers from across the states in the United States Capitol. "It is imperative that our legislature hears our voice, straight from the farm" says Janssen, current IPPA President. 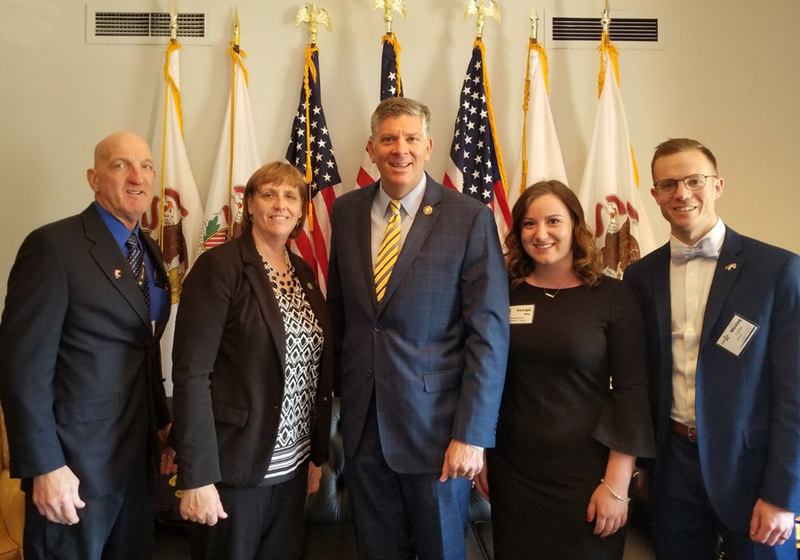 (From L) Dale Wietekamp, IPPA President Elect; Pam Janssen, IPPA President; Congressman Darin LaHood; Georgia Miller, NPPC Intern; and Dr. Wesley Lyons, Future Leaders, visited about current issues facing pork production. 2. Ending trade disputes with China that are limiting export opportunities at a time when the world's largest pork consuming nation is seeking reliable suppliers of pork. A farmer's ability to choose the production method that maximizes productivity, increases sustainability, reduces disease exposure and improves the health and welfare of his or her animals is critical to the pork industry's success. This freedom has been jeopardized by recent state prohibitions on scientifically-sound production methods. These state mandates raise food costs while reducing consumer choices. Our industry is in favor of letting the farmer choose his or her production method. There are currently more than 2,000 farms producing 5.1 million total hogs in the state. In Illinois, the pork industry contributes over $1.8 billion to the state's economy, generates more than $170 million in taxes and provides more than 21,900 jobs. Even as the number of farmers in our state continues to decrease, those remaining are producing more pork than ever before, for their families and yours.